Human hair wigs are more expensive then the synthetic varieties even from professional hair factory, human hair wigs allow for a more natural appearance, whether it's for every day use or for a stage play. However, when it comes to caring for the wig, just because it's real hair does not mean you treat it like the hair on your head. There are things you need to do to protect your investment which will allow the wig to look good for more than two years. Hot rollers, curling iron, or Velcro rollers. Protect the human hair wig from an oily appearance by keeping your own hair clean. Besides washing your own hair, you can also wear a wig cap under the human hair wig. Wash human hair wig infrequently; wear it for about six times between washings. However, if it starts looking oily or dirty, then decrease the wearing time and wash immediately. Remove tangles from the virgin human hair wig before washing. Use a wig pick for a curly wig or a wig brush for a straight wig. Comb/brush through the tangles carefully. 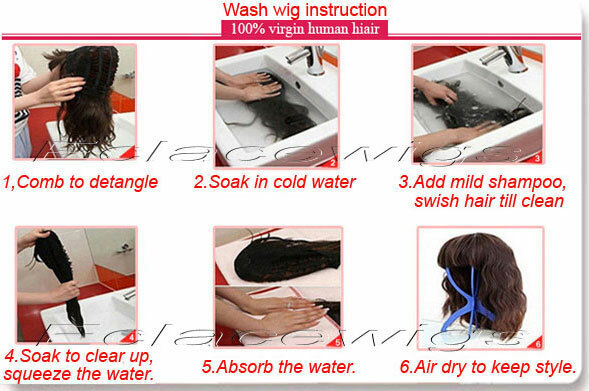 Fill a sink with lukewarm water and add wig shampoo. Soak the human hair wig for five minutes in the soapy water. Gently squeeze out excess water. Rinse well in lukewarm water carefully. Place the human hair wig back in the sink. Pour shampoo in your hand and gently massage the wig. Be careful not to overdo the massage. Rinse well in lukewarm water! Pour conditioner in your hand; the amount will depend upon the bottle's directions. Massage it into the wig and allow to stand for five minutes. Rinse well in lukewarm water. Squeeze out excess water gently. Place the human wig in a towel and blot gently to towel dry. Place the wig on the wig stand to air dry. If you need to wear it soon, a human hair wig can be dried with a blow dryer set on low. it is better to let human hair wig air dry. Comb or brush gently through the human hair wig. Style using hot rollers or curling iron or Velcro rollers. Set with a wig spray or light hairspray. If you don't have access to wig products, human hair wigs can be washed with gentle, low-soap shampoo such as shampoos for colored hair and a mild conditioner so on. Use washings to check the human hair wig to determine if any knots are loose and need to be repaired for long using.